Larger than the restaurant is Rajen’s commitment to the elevation of all people in Nepal, regardless of class or caste standing. 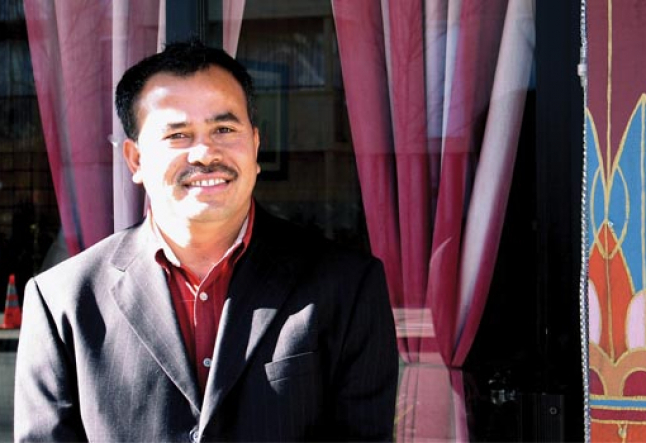 Nepal is Rajen’s ancestral home, although he grew up in India, educated and respected. Living in India, he saw the Nepalese immigrants arriving with no belief in, or imagination of what might be possible in their lives. His dream became to educate the next Nepalese generation, in the hope of reducing poverty and changing the system from within Nepal. When Rajen graduated from a prestigious English-speaking university and left for Nepal, his dream began to manifest. In 1983, he arrived in Itahari, a crossroads city between India, Kathmandu and Dharan (Nepal’s second-largest city), with “two pairs of pants and two shirts.” The locals warmly embraced him, and at twenty-three, he became Vice Principal of a secondary school, and later Head Principal. In 1993, Rajen founded a school, the Modern Preparatory Secondary Boarding School, that would include “untouchable” children (of the “tallo zati” lower class). The school now serves 800 students a year, including 125 “untouchables” whose boarding, school and living expenses are paid. While living in Nepal, Rajen visited small villages in the area to invite children to the school. Rajen’s nephew continues this practice as Principal in Rajen’s absence. Rajen and the school quickly earned recognition. The school received the world’s largest solar reflectors through the cooperative efforts of the German, Swiss and Swedish governments, with additional help from Adolf Rav and the One World Group (a group dedicated to the unification of the world as one people). The solar reflectors now produce the energy necessary to provide 240 students with three meals a day.